These map layers display information on the probabilities of collision (erosion) and inundation on sandy beaches during extreme storm conditions. Probabilities represent the likelihood that wave runup and storm surge will reach the dune toe (collision) or the likelihood that wave setup and storm surge will submerge the beach and dune crest (inundation) from a direct impact. The storm-induced water levels, due to both storm surge and waves, are compared to beach and dune elevations every 1-km along the coast to estimate probabilities. The nor'easter scenario is based on a storm-impact scaling model that uses observations of beach morphology and hydrodynamic models to predict how the coast will respond to these storms. The hurricane scenarios are based on observations of dune morphology and modeled storm surge and wave runup for generalized storm conditions. All data and map layers are from the USGS Coastal Change Hazards Portal. The Northeast is affected by winter coastal storms each year and occasionally by tropical storms and hurricanes. Coastal habitats and species are vulnerable to storm impacts, particularly erosion and flooding due to storm surge and heavy precipitation. While climate change is expected to affect the intensity, duration, frequency, and track of coastal storms, understanding the relationship between climate change and coastal storms remains challenging. Climate models are continually improving and increasing our understanding of how coastal storms may change in the future. Over the last century, hurricanes have made landfall in the Northeast 8 times, with the greatest impacts in Massachusetts on Cape Cod, Martha’s Vineyard and Nantucket. Two recent and notable storms, Hurricanes Irene (August 2011) and Sandy (October 2012), had major impacts on natural resources and human infrastructure in coastal and inland areas of Massachusetts and regionally. These events demonstrated that many of the state’s and region’s coastal resources are highly vulnerable to extreme storms and flooding. Tropical cyclones are fueled by warm ocean surface waters. As the ocean becomes warmer, not only will hurricanes become stronger, but the source of fuel for hurricanes may expand northward. This will enable hurricanes to live longer and maintain their strength further north. As a result, tropical cyclone tracks may shift along the Atlantic coast with a corresponding rise in the number of hurricanes making landfall on northern Atlantic coastal states such as Massachusetts.18 In the past, hurricanes have generally weakened into tropical depressions by the time they moved into the region; more hurricane-force conditions means there could be greater impacts of extreme storm events on New England states. While global climate models are continually improving, the spatial resolution of climate models remains too coarse to adequately capture storms and predict with certainty how tropical cyclones will change as a result of climate change. Projections of tropical cyclones are also limited by the complexity of hurricane development and our incomplete understanding of related and interacting climate variables, such as wind shear, vertical temperature gradients in the atmosphere, and warming in the tropical Atlantic Ocean. However, there is high confidence in how climate change will affect variables related to tropical cyclone development. For instance, ocean temperatures are expected to continue rising, which means tropical cyclones will likely get stronger overall. A class of winter coastal storms known as nor’easters (named for the predominant wind direction experienced in the areas affected) is a major threat to Northeast coastal ecosystems. Nor’easters produce long periods of heavy snow or rain and strong winds, which can lead to high tides, coastal flooding, and beach erosion, as well as large accumulations of snow and rain further inland. 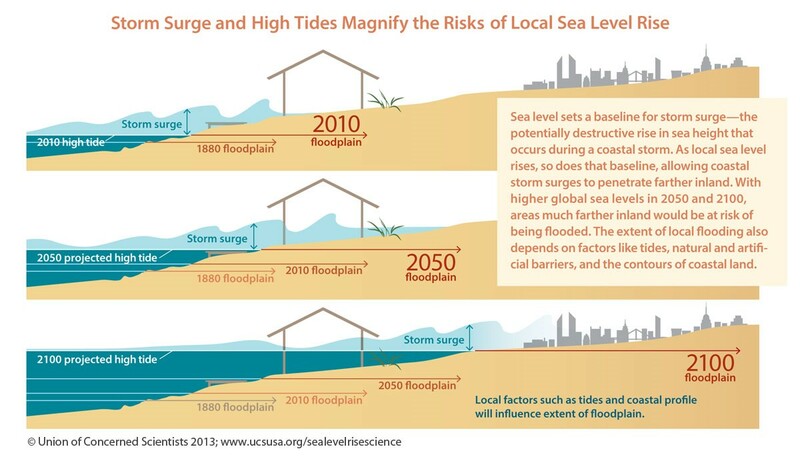 Sea level rise is expected to interact with storm surge and high tides and exacerbate coastal flooding further inland. Figure courtesy of the Union of Concerned Scientists. Storm surge associated with coastal storms is likely to become more destructive due to rising sea levels and stronger tropical cyclones.1,10 The potential risk posed by these interactive, compound effects can especially lead to impacts in tidal estuaries and other coastal habitats, but also relatively far inland. Therefore, the encroachment of saltwater into coastal ecosystems and aquifers (saltwater intrusion) is very likely to be an issue of increasing concern. Saltwater intrusion can be worse when a hurricane remains well offshore, as coastal areas may experience storm surge but not the rainfall associated with the storm that can help dilute the added saltwater. In low lying areas, flooding may become worse, not only due to heavier rain events, but because higher sea levels will reduce drainage to the ocean. This may enhance pollution impacts on fish and wildlife in affected areas, especially in formerly industrial sites. The effects of coastal storms on habitats and species will be variable, but in general, risks to coastlines and coastal ecosystems will increase. In some cases, storms can be beneficial to coastal habitats and species.10 For instance, natural processes that occur during storms such as overwashing (when storm waves exceed the height of a dune or other barrier and deposit sand inland) and breaching (a channel cut through a barrier island or section of coast formed by storm waves, tides, or currents) help to redistribute sediments and maintain or create habitat for shorebirds and other species. These natural processes also enable barrier islands to respond dynamically to sea level rise and storms by migrating inland.13,14 However, major hurricanes can be destructive to coastal ecosystems by temporarily, and in some cases permanently, altering habitats that species rely on.5,6 For instance, Hurricane Sandy decreased horseshoe crab spawning habitat by 70% on the New Jersey side of Delaware Bay.11 Extreme coastal storms can also result in the flooding of shorebird and other wildlife nesting areas and lead to direct mortality. Much of our coastal infrastructure was built with 20th century climate conditions in mind. This means that any future changes to storm tracks, intensity, or frequency will also have significant impacts on our coastal communities. Taking action now can help communities prepare and increase their resilience to a range of future scenarios. 1. Anthes, R.A., R.W. Corell, G. Holland, J.W. Hurrell, M.C. MacCracken, and K.E. Trenberth. 2006. Hurricanes and global warming: Potential linkages and consequences. Bulletin of the American Meteorological Society 87: 623-628. 2. Bengtsson, L., K.I. Hodges, M. Esch, N. Keenlyside, L. Kornblueh, J.J. Luo, and T. Yamagata. 2007. How may tropical cyclones change in a warmer climate? Tellus A, 59, 539-561. 3. Colle, B.A., K. Rojowsky, and F. Buonaito. 2010. New York City Storm Surges: Climatology and an Analysis of the Wind and Cyclone Evolution. Journal of Applied Meteorology and Climatology, 49, 85-100. 4. Frumhoff, P.C., J.J. McCarthy, J.M. Melillo, S.C. Moser, and D.J. Wuebbles. 2007. Confronting Climate Change in the U.S. Northeast: Science, Impacts, and Solutions. Synthesis Report of the Northeast Climate Impacts Assessment (NECIA). Cambridge, MA: Union of Concerned Scientists (UCS), 160 p.
5. Gieder, K.D., S.M. Karpanty, J.D. Fraser, D.H. Catlin, B.T. Gutierrez, N.G. Plant, A.M. Turecek, and E.R. Thieler. 2014. A Bayesian network approach to predicting nest presence of the federally-threatened piping plover (Charadrius melodus) using barrier island features. Ecological Modelling, 276, 38-50. 6. Gutierrez, B. T., N. G. Plant, E. R. Thieler, and A. Turecek. 2015. Using a Bayesian network to predict barrier island geomorphologic characteristics, J. Geophys. Res. Earth Surf., 120, 2452–2475, doi:10.1002/2015JF003671. 7. Holland, G.J. and P.J. Webster. 2007. Heightened tropical cyclone activity in the North Atlantic: natural variability or climate trend? Philosophical Transactions of The Royal Society A: Mathematical, Physical and Engineering Sciences, 365, 2695-2716. 8. Knutson, T. R., J. L. McBride, J. Chan, K. Emanuel, G. Holland, C. Landsea, I. Held, J. P. Kossin, A. K. Srivastava, and M. Sugi. 2010. Tropical cyclones and climate change. Nature Geoscience 3:157-163. 9. Horton, R., G. Yohe, W. Easterling, R. Kates, M. Ruth, E. Sussman, A. Whelchel, D. Wolfe, and F. Lipschultz. 2014. Ch. 16: Northeast. Climate Change Impacts in the United States: The Third National Climate Assessment. J. M. Melillo, T. (.C.). Richmond, and G. W. Yohe (eds.). U.S. Global Change Research Program: 371-395. 10. National Wildlife Federation [NWF] and Manomet. 2014. The vulnerabilities of northeastern fish and wildlife habitats to sea level rise. A report to the Northeastern Association of Fish and Wildlife Agencies and the North Atlantic Landscape Conservation Cooperative. National Wildlife Federation and Manomet Center for Conservation Sciences, Manomet, Plymouth, MA, 55 p.
Society of Japan 84: 259-276. 13. Schupp, C.A., N.T. Winn, T.L. Pearl, J.P. Kumer, T.J.B. Carruthers, and C.S. Zimmerman. 2013. Restoration of overwash processes creates piping plover (Charadrius melodus) habitat on a barrier island (Assateague Island, Maryland). Estuarine, Coastal and Shelf Science, 116, 11-20. 14. Seavey, J.R., B. Gilmer, K.M. McGarigal. 2011. Effect of sea-level rise on piping plover (Charadrius melodus) breeding habitat. Biological Conservation, 144 (1), 393-401. 15. Staudinger, M.D., T.L. Morelli, and A.M. Bryan. 2015. Integrating Climate Change into Northeast and Midwest State Wildlife Action Plans. Department of the Interior Northeast Climate Science Center Report, Amherst, Massachusetts, 52 p.
16. Trenberth, K.E., P.D. Jones, A. Ambenje, R. Bojariu, D. Easterling, A.K. Tank, D. Parker, F. Rahimzadeh, J.A. Renwick, M. Rusticucci, B. Soden, and P. Zhai. 2007. Observations: Surface and atmospheric climate change. In: S. Solomon, D. Qun, M. Manning, M. Marquis, K. Averyt, M.M.B. Tignor, H.L. Miller, Jr., and Z. Chen (eds.) Climate Change 2007: The Physical Science Basis. Contribution of Working Group I to the Fourth Assessment Report of the Intergovernmental Panel on Climate Change. Cambridge, U.K.: Cambridge University Press. 17. Webster, P. J., G. J. Holland, J. A. Curry, and H.R. Chang. 2005. Changes in tropical cyclone number, duration, and intensity in a warming environment. Science 309:1844-1846. 18. Yin, J. H. 2005. A consistent poleward shift of the storm tracks in simulations of 21st century climate. Geophysical Research Letters 32:L18701.